Welcome :: Smudge Web Services Inc.
"Design is not just what it looks like. Design is how it works"
Smudge Web Services Inc is an Aboriginal owned business based out of Ottawa specializing in website design, web application development and event registration services. We put an emphasis on customer satisfaction and promise to provide web and event registration services tailored to the business needs of our clients. Happy clients are essential to our business. Let your vision guide us. We take the time to build it right. We specialize in delivering services to Aboriginal and non-profit organizations and we understand the potential funding restraints that are often placed on our clients. Let's work together to find the right solution for you. 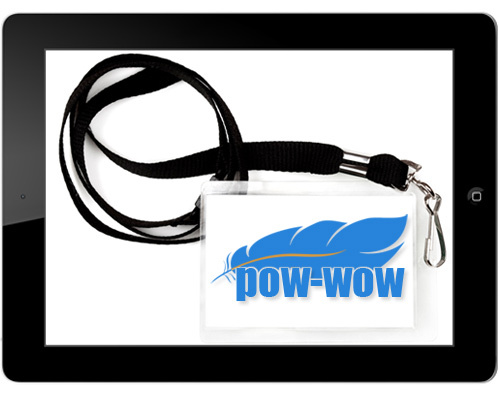 Pow wow is a web-based meeting and event registration system. Pow Wow is a scalable application which captures all registration data and meeting history, provides both on-line and on-site registration services and offers dynamic reporting options capable of running on multiple platforms and mobile devices. Websites are a statement about an organization. Let Smudge help you make the right one. Web applications are critical to the growth of a business in today's economy. Every organization has different needs. Let us build a custom application that will work for you. SWeb traffic 101: Content is what keeps people coming back. Smudge can help ensure you keep your site up to date. We can also make the process of updating your site simple. Not only do we have access to one of the largest and premium stock image collection on the web, we also do graphic design. We can help ensure your staff have the expertise and experience to deliver a seamless registration experience for your participants. We offer both on-line conference and on-site training. Need equipment to help run your next event? Smudge can help; We put an emphasis on portable, secure and easy to use equipment. Ask about renting our iPads. Printing badges or name tags for your event or meeting? Smudge can provide cardstock and lanyards. Smudge Web Services is experienced in delivering visually impressive sites. Our job is to ensure your organization is accessible and relevant in today's instant access world using all the latest trends in layout, content, social media and mobile access. 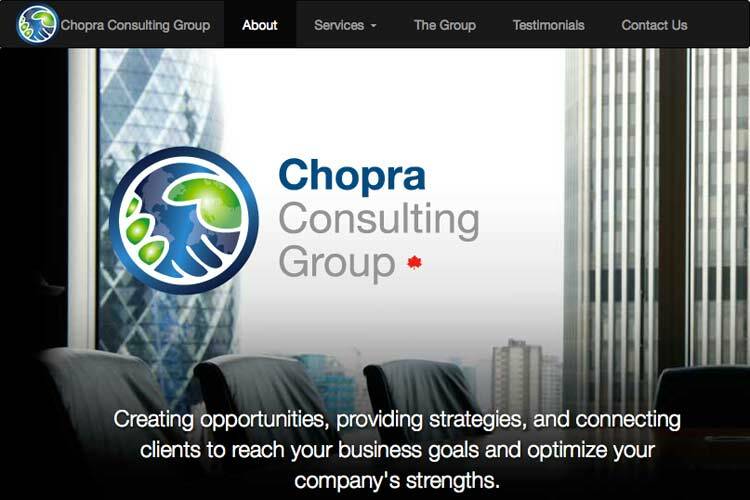 Chopra Consulting Group Inc. (CCG), a Toronto-based government relations and media communications firm with associates across the country, helps clients achieve their business objectives by connecting them with key decision-makers and influencers in Canada’s federal, provincial, municipal and Aboriginal/First Nations governments, corporate Canada and the media. Headed by Ajay Chopra clients achieve optimal results due to the professional know-how and intelligent guidance that comes with over 15 years of experience in politics, government, government relations, media relations and the private sector. Ajay is supported by a national team of experienced and insightful professionals. Please visit www.ccgrp.ca to view the full site design. Let the Gallery Custom tattoo artists create a one of a kind custom tattoo from your ideas or imagination. Our artists combined together can offer you all styles of tattooing from photo realism, new school, old school, portraits etc... All your tattoo needs can be satisfied in our state of the art, comfortable and welcoming studio. Please visit www.thegallerytattoo.com to view the full site design. 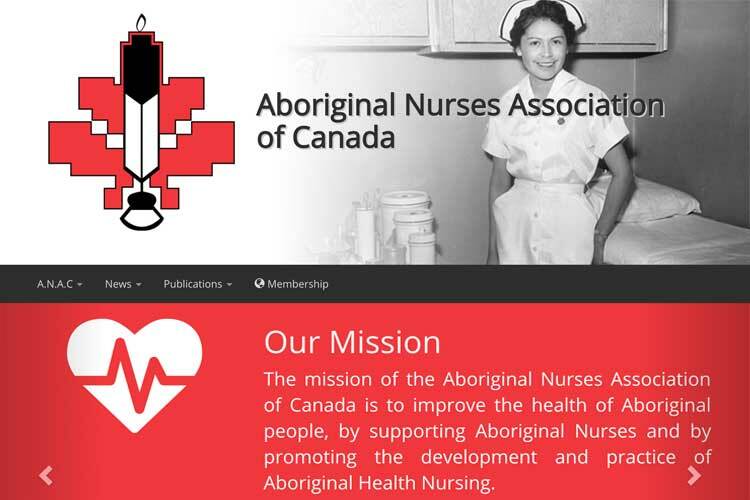 The mission of the Aboriginal Nurses Association of Canada is to improve the health of Aboriginal people, by supporting Aboriginal Nurses and by promoting the development and practice of Aboriginal Health Nursing. In advancing this mission, the Association will engage in activities related to recruitment and retention, member support, consultation, research and education. Please visit www.anac.on.ca to visit the full site design. 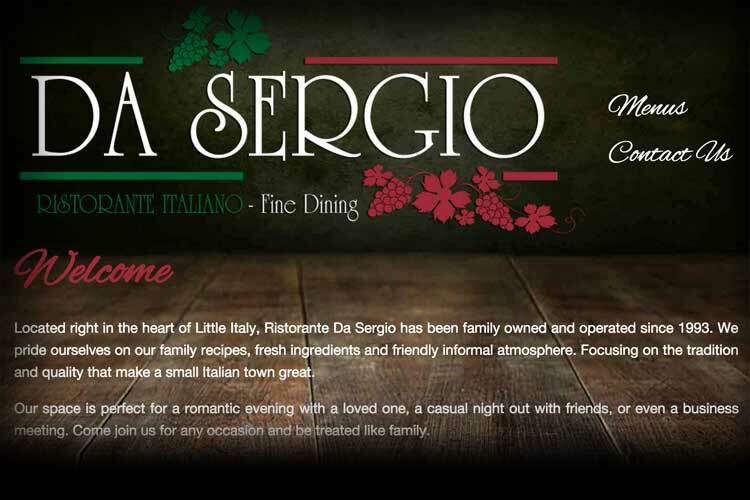 Located right in the heart of Little Italy, Ristorante Da Sergio has been family owned and operated since 1993. We pride ourselves on our family recipes, fresh ingredients and friendly informal atmosphere. Focusing on the tradition and quality that make a small Italian town great. Our space is perfect for a romantic evening with a loved one, a casual night out with friends, or even a business meeting. Come join us for any occasion and be treated like family. Please visit www.dasergio.ca to view the full site design. Our goal is to restore proper function to the nervous, muscle and joint systems to help minimize or eliminate your pain. 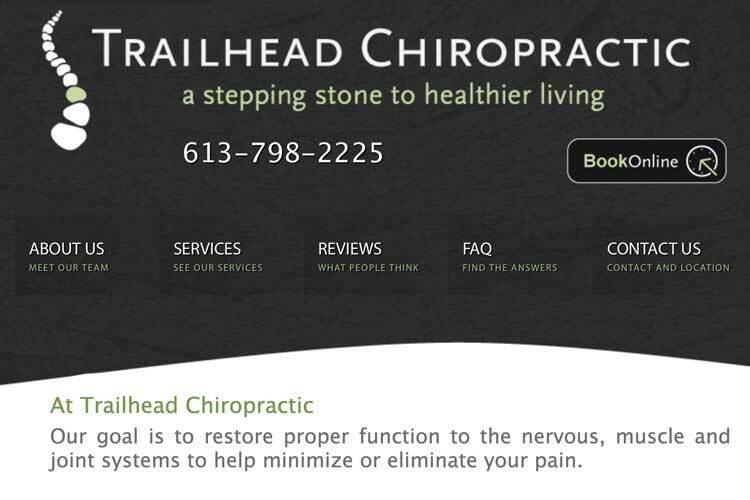 Please visit www.trailheadchiropractic.ca to view the full site. We can help you make your mark on the web. Registering participants for an event using Pow wow is quick and easy. A core feature of the application is the ability to manage group registrations. When adding new participants to an existing registration all information is copied except for the Name and Participant Type. When accessing a participant in a group registration all other participants in that group are listed for quick review of the group registration or one click access to the other participant’s registrations. Payments are linked to participants. A payment can also be made for a group of participants or an individual, even if a participant is in a group registration. Our online registration system allows you to pre-register users for an event. Simply create a meeting with an open and close date for registrations and share the URL to your participant base. Pre-registration of participants significantly expedites the registration process, as they simply need to process any outstanding balance and provide no further information. On-line payments be accessed through paypal or using the organizations own merchant account. We have made the intricate part of tracking payments effortless. Our system allows for individual and group payments, partial payments, customizable payment types and refunds. All payments are linked to participants, but that does not mean a payment has to be applied to one immediately. Participants can also be added to a payment after it has been made, should there be a positive balance in the payment. This allows for balances from group payments to be applied to additional participants both new or previously registered. Another core feature in Pow wow is the ability to run multiple meetings. When a user logs in they can choose from a list of the current available meetings to set their active meeting. A user can also switch their active meeting from the user preferences section. Historic meetings can be accessed at any time for record searches or Dynamic Management Reporting. Pow wow provides several informative summary and analysis management reports. Our event reports present a high level and graphical view of registered participants, as well as detailed records summaries. Use our quick charting tool to build your own graphical breakdown of your event. The true benefit of using Pow wow comes in the numerous and dynamic event options available in our administration sections. Authorized users can add and configure meetings, participant types, printers and tax rates. 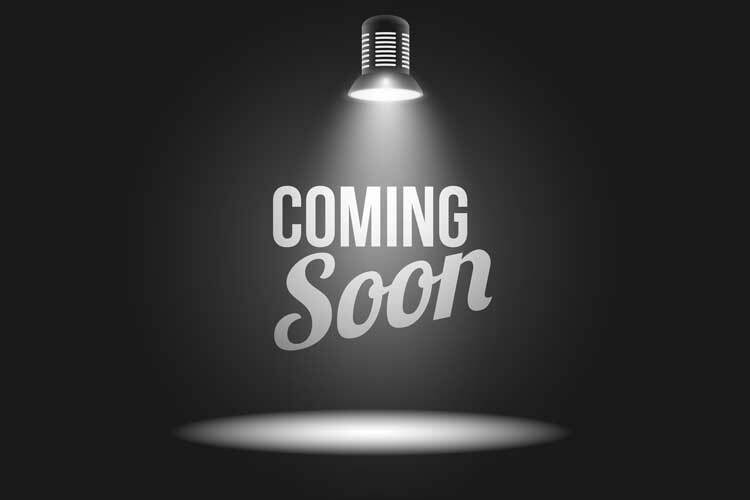 Under administration users can also manage users, configure global notes, send confirmations, create mailing lists, authorize mobile devices, and manage the client list available to “quick find” and register participants. Our communications section in Pow wow is designed to offer immediate or scheduled communications with participants registered for communications blasts. Participant records are flagged as being included in either email or text messaging blasts for event updates or alerts. When scheduling a communication record Pow wow allows the ability to choose a specific date and time to send the communication to participants. Any scheduled communication can be triggered to fire immediately using the send now option. Our text messaging option comes with additional charges should you exceed 1000 message sent in a meeting. Using QR code technology coupled with mobile devices our election component was developed to reduce wait times, simplify polling rounds and provide detailed and accurate reports on the results. The polling round tracking feature is designed to allow a limited set of participants access via the QR Code scanning. Our polling Reports provide real-time results of the progress of a polling round. Smudge is designed from the ground up in asp.NET with the goal of having no client side software installation required for users. We use a scalable SQL Server database to manage your data when handling an event. With full support for IE 9+, Safari, Firefox and Chrome as well as support for iOS Safari our accessible solution will be simple to use with no software installation required. Copyright © 2015 Smudge Web Services Inc.